Now it was the Preparation Day of the Passover, and about the sixth hour. And he said to the Jews, “Behold your King!” But they cried out, “Away with Him, away with Him! Crucify Him!” Pilate said to them, “Shall I crucify your King?” The chief priests answered, “We have no king but Caesar!” Then he delivered Him to them to be crucified. Then they took Jesus and led Him away. And He, bearing His cross, went out to a place called the Place of a Skull, which is called in Hebrew, Golgotha, where they crucified Him, and two others with Him, one on either side, and Jesus in the center (John 19:14-18). Every year thousands of pilgrims visit Jerusalem and walk the Via Dolorosa (The Painful Way), a route that winds through the ancient city toward the modern-day Tomb of the Holy Sepulcher, the traditional site of Jesus’ burial. Of course, the path that our Savior took that day is not known with great precision, as nearly all of the landmarks mentioned in the four gospel accounts have been lost to history. The true Via Dolorosa is more than the winding, cobbled streets of an ancient city. This road is much longer and much older than that half-mile road to Calvary. This old road is one that we can say began with the fall of man, when God made the first move toward human redemption (Genesis 3:15). This road was planned by the Father, charted by the prophets, and graded and straightened by John the Baptist (Matthew 3:3) before Jesus walked it. This path led from Bethlehem to Egypt and then doubled back to Nazareth, whence it crisscrossed the Galilee, and turned at last toward Jerusalem. Although the precise route of Jesus’ final walk before His death has long been forgotten, the way of the cross that leads to heaven has been preserved for us in Him and His Word (John 14:1-6). The way of the cross was charted in remote antiquity. This was accomplished by following a course predetermined by God (Acts 2:23; 4:28; Revelation 13:8). The course of this road was announced in prophecy, proceeding through Abraham (Genesis 12:3), Isaac (21:12), Jacob (28:14), and Judah (49:10). Its course was further mapped out in the types and shadows like the Passover lamb (Exodus 12:23), the sacrificial rites of the great Day of Atonement (Leviticus 16), and all the sacrifices placed upon the altar of the great temple. The way of the cross was marked with adversity. Along the road, Jesus met enemies from the day of His birth (Matthew 2), in His own hometown (Luke 4:29-30), and from the self-appointed leaders of God’s people (Matthew 21-22). If this were not enough, He was denied by one of His most intimate disciples (Matthew 26:30-75) and betrayed by another into the hands of sinners (cf. Psalm 41:7-11). Just as Shimei the Benjamite cast stones and insults at David as he left Jerusalem in disgrace during his son’s rebellion (2 Samuel 16:5-8), ignorant bystanders insulted the Messiah as He bled and died on the cross for them (Matthew 27:39-43). And as Jesus made the dreadful walk toward the cross, the load on His back only added to the struggle. Three of the evangelists tell us that a man named Simon had to carry Jesus’ cross part of the way (Luke 23:26), but there was a weight of sorrow that Jesus carried even to the garden (Matthew 26:38), a weight with which no one could assist Him but His Father. The way of the cross is one that every Christian must follow. The way of the cross is still marked with tribulation (John 16:33; 2 Timothy 3:12). Jesus Himself said that it is a narrow way that is difficult to travel (Matthew 7:13-14). Fortunately, we have a Guide Who has traveled this road before. When Israel set out on the final leg of the road to Canaan, Joshua ordered them to follow the ark and to leave a space of about half a mile between it and them, for he said, “you have not passed this way before” (Joshua 3:4). We have not been this way before, but our Lord has, and when we go through the dark lonely valleys, His rod and staff—like those of a loving shepherd—will help us navigate the treacherous path (Psalm 23:4). 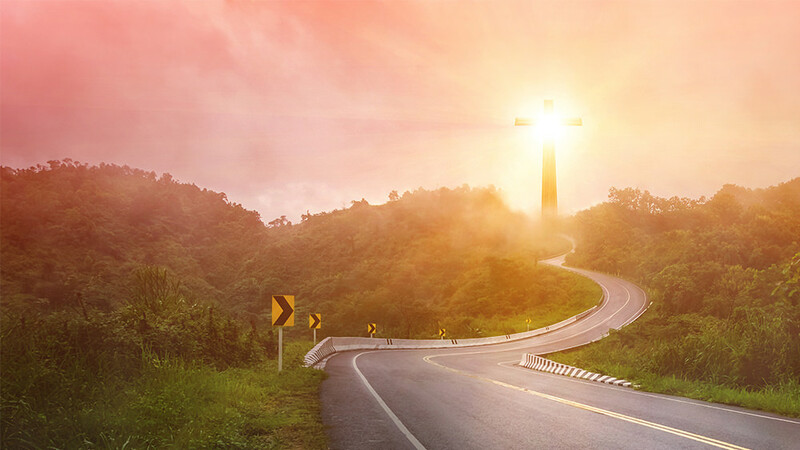 The way of the cross may not be easy, but the way of the cross leads home! Copyright © 2019. Originally published in The Elizabethton Edifier, June 10, 2018; copyright © by Roby Ellis.